Why A Shoe Tree Is The Perfect Present! The perfect present is one which looks great, is incredibly useful, lasts a long time and will be gratefully received… a Shoe Tree ticks all the boxes – and is the perfect practical present for Men and Women. Of course a Cedar Shoe Tree also smells wonderful which is another benefit! With so many to chose from now too there really is something for everyone and every type of shoe. Shoes can cost a lot of money so keeping them in great shape makes sense, but Shoe Trees aren’t just for keeping your shoes in shape. Use them inside your shoes when cleaning and polishing them to help you get into the creases properly and makes this much easier because it gives you more to hold on to. Talking of creases, whilst holding the shape of the shoe they also makes creases less likely by keeping them in the correct shape. Great for shoes you wear often, but Shoe Trees are brilliant for shoes that you don’t frequently wear as they will help prevent shrinkage – ideally you shouldn’t wear the same pair of shoes too often anyway, giving the leather time to relax keeps them in good condition and will make them last longer. Yet another benefit is discovered after you’ve been wearing your shoes in the rain, which in the UK is a frequent occurrence! Putting Shoe Trees inside after they’ve been wet ensures they don’t become disfigured. Allow them to dry out thoroughly after being out in the rain – put them on their sides and leave your Shoe Trees in, which absorbs moisture from the upper section and putting on their sides keeps the moisture from the soles, and ensures a thorough drying out. Shoes that have become misshapen from not being allowed to dry out properly with Shoe Trees can become extremely uncomfortable, and reduces the life of the Shoes no matter how good quality they are. 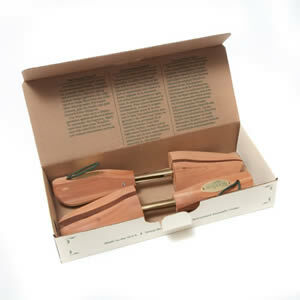 When looking at quality Cedar Shoe Trees really can’t be beaten though, Woodlore have become famous for creating top quality Wood products and their Cedar Shoe Trees are no exception. Available for men and women in various sizes, many feature an adjustable split toe and a full contoured heel & a high instep completely fill the shoe for a precise fit. A handsome polished brass knob & brass plated steel hardware complete the look of this design completes the look and makes it the perfect present – often they are also presented in a gift box. So, if you want to give someone a gift they’ll love and actually use for once – give them Shoe Trees.